Guillermo del Toro's "Pan's Labyrinth" is one of the cinema's great fantasies, rich with darkness and wonder. It's a fairy tale of such potency and awesome beauty that it reconnects the adult imagination to the primal thrill and horror of the stories that held us spellbound as children. If you recall the chills that ran down your spine and the surreal humor that tickled your brain in the presence of "Alice in Wonderland," "Little Red Riding Hood" or "The Wizard of Oz" when you were a child (or, later, in the nightmarish dream-films of Luis Bunuel, Jean Cocteau, F.W. Murnau or David Cronenberg), you'll discover those sensations once again, buried deep in the heart of "Pan's Labyrinth." As gruesome and brutal as it is enchanting and spellbinding, "Pan's Labyrinth" is a movie intended for adults, not children, as its "R" rating indicates. Some kids under 17 will find it fascinating (especially if they know Spanish or don't mind reading subtitles), but it's a harsh and uncompromising film -- although less gory and violent than many video games. "Pan's Labyrinth" is itself a narrative maze, with multiple stories that branch and eddy, flowing apart and back together again like the a stream tumbling down a rocky hillside or, more aptly, blood spilling over a craggy boulder. Opening titles set the story in Spain, 1944, as resistance fighters lurking in the mountains continue to fight Franco's fascist regime. And then, immediately, before we can grasp any visual bearings in that world, the subterranean voice of Pan (a faun, whose name "only the wind and the trees can pronounce") whisks us into a fable about a dead princess whose kingly father waits for his daughter's soul to return in another form, and to reclaim her place at his side. My wife still puts her hands to her eyes palms out, fingers splayed, when she wants to freak me out. The eye monster was inspired by the poster for another horror classic, Phantasm. I love this movie but find it too heartbreaking to watch. Same here. This is one of the few movies I own on DVD but I've never had the fortitude to watch it a second time, even though I think it's Guillermo del Toro's best film. I haven't felt the fortitude to watch this one a second time either, but I still listen to the soundtrack sometimes. Absolutely haunting. When I saw this posted I had the same reaction. "Oooooh! Yes! . . . But, can I really watch this again? Now?" Last night, I watched Pacific Rim for the first time. It was okay, I guess, but all I could think was "How is this GdT's movie?" I wanted clockwork nightmares and ambiguous fantasies. Count me as another person who watched it once, loved it, and swore never to watch it again. My sister had seen the movie and wanted my dad and I to watch it, but I had heard the buzz about how brutal it was. I'm pretty squeamish, so I asked my sister to warn me if something particularly gory was coming up so I could not look. We lasted only a bit into the movie before the generalissimo beats the crap out of the rabbit hunter with the bottle, to much gory effect, and my sister had said NOTHING to warn me. I shrieked, "Gah!!! Geez!!! I thought you were going to warn me about these kind of things!!!!" And she responded, "Look, he beats up a lot of people in this movie, it's hard to remember every single time." I've taught this film--the students loved it, even though subtitled films don't always go over well--and there's so much to be said about everything from the design to the critique of authoritarianism. But I definitely warned them ahead of time about that bottle scene. I loved this. It is one of my favorite films of all time. Once I found out that the man I was dating could do a guttural and perfect imitation of Doug Jones as the Faun. I . . . felt things. I was totally traumatized by this movie, but that's because I didn't know anything about it prior to going to the theater--except that the friend who invited me described it as "a lot like the Narnia movies!" IMAGINE MY SUBSEQUENT HORROR. Gorgeous, but yeah, can never bring myself to see it again. "a lot like the Narnia movies!" The last time my friends tried to pull that on me, it was all about how I needed to see Peter Jackson's Dead Alive to understand what the Lord of the Rings movies would be like. You got punked way harder. The best part about the violence in this movie is that it always cuts away, but just a second after the gruesome thing happens, so the vision of it happening is the last thing you remember from the scene. It just makes the violence that much more awful. Simpsons Treehouse of Horror XXIV Couch Gag by Guillermo del Toro. (description). Storyboard by Guy Davis of Mr. Burns as the Pale Man. I dunno, I think it was a case of sky-high expectations, but I was a bit disappointed when I saw it. I found the symbolism ham-handed - the film in general lacked any skerrick of subtlety to me. Everyone spoke about the fairy tale she goes into, but what existed outside was just as much of a fairy tale, the characters were paper-thin and I found it lacked much nuance or ambiguity. It was beautiful - all his films are - but I didn't feel it was really saying anything particularly interesting or novel, that hadn't been said better before. Thomas, I would love to hear about some of the themes you discuss with your students. Righteous disobedience is a big one--both the fantastic and realistic modes of the film ask what true resistance to evil entails, and Ofelia's three trials are all about when and why you need to disobey orders. What makes this fun to teach is the film's structure, which is built on complementarity--when I first saw it, I immediately thought of Blake's Songs of Innocence and Experience--so everything that Ofelia learns and experiences in the "fantastic" world, associated with childhood (albeit a very dark childhood) has its response in the "real" world, associated with adulthood. Students have a grand time picking up on all the echoes uniting the realistic and fantastic worlds,even though the parallels are usually time-shifted (e.g., the two banquets). (I interpret both aspects of the film as "real"; the adults have all lost the ability to perceive the fantastic incarnate in the ugly everyday world.) Thus, Ofelia's final choice has been anticipated by the Doctor, but not only is his decision more troubling (mercy killing vs. saving a baby), but also he gets no return to a fantasy kingdom as compensation for it. I saved it on my parents' DVR once, and my mother didn't realise it was mine, so she watched it knowing nothing and deleted it so she would not even have to see the title again. It's probably the saddest movie I've ever seen. It's wonderful; I'd love to rewatch it, except I'd prefer not to get that depressed. 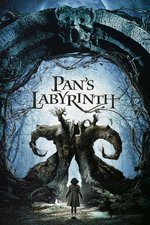 Movies with Mikey: Pan's Labyrinth- "A delicate fantastical take on using metaphors common to a coming-of-age film, but like, weaponizing them against you."